NORFOLK, Va. (WAVY) -- Nauticus is celebrating their 25th birthday by bringing a massive, inflatable maze of art and light to Downtown Norfolk this week. 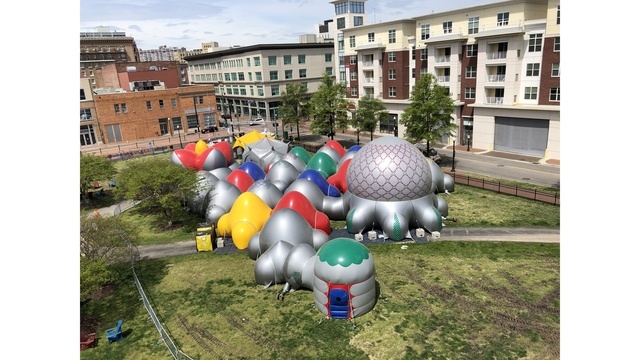 From April 12 to April 21, visitors can walk through the "Albesila" luminarium by Architects of Air on MacArthur Center Green. It will be open from 12 p.m. to 6 p.m. during the week and from 10 a.m. to 6 p.m. on the weekend. This celestial-like maze is made up of 27 egg-shaped domes and is about half the size of a football field. Visitors are asked to remove their shoes in order to preserve the delicate, hand-sewn PVC that the structure is made out of. Walking through the tunnels of the structure ignites all of your senses. Natural light from outside trickles in through the colorful domes and soft music plays from unseen speakers to create a dazzling world of hues and harmony. "Generally we find that people come in, find the color and space they like and just relax, lie down, roll around on the floor, stick with their family and just have a great time," said Gabriel Burden with the Architects of Air troupe. The Nottingham-based company travels across the globe, bringing their unique luminarium experience along with them. They have multiple structures, each with a different design and name, that they pop up with in any given city. Burden says, "We go to all different societies and cultures, which is fascinating and how people react and how people behave inside is really different." The giant, inflatable structures take months to create, but -- with the help of local crews at each of its stops -- the apparatus takes only a day or two to resurrect. Led by Architects of Air Founder and Designer Alan Parkinson, the team conceived "Albesila" as an ode to the first design that launched it all back in 1992. "Albesila" differs from most of their other inflatable designs in that the tunnels are more airy and interconnected, making it feel bigger, according to their website. 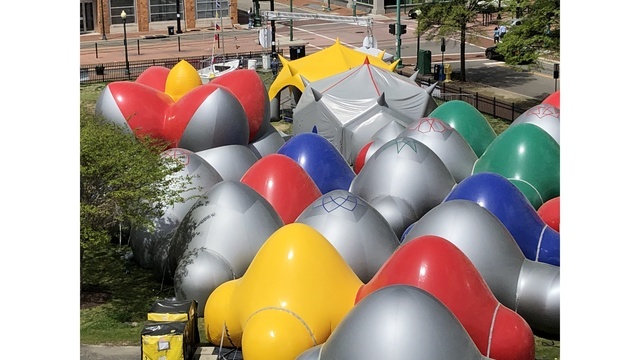 In 2017, Nauticus brought a smaller luminarium to Downtown Norfolk from the group, called "Arboria." In its four days, it attracted nearly 7,000 people. Tickets are $6 per person and can be purchased on-site. It is accessible for anyone with disabilities and a limited number of advanced tickets can be purchased online to get inside quicker. 25 Photos Copyright 2019 Nexstar Broadcasting, Inc. All rights reserved. This material may not be published, broadcast, rewritten, or redistributed.